The answers to the five starred clues have a very unusual property in common. What is it? And can you think of a familiar two-word exclamation, of five and three letters, respectively, that shares that property? 17a, JOHN JAY [*First Supreme Court chief justice]. I feel like I’ve seen a lot of pedantry around whether the title is, in fact, Chief Justice of the United States. I don’t mind this more casual approach. A gimme for me, since there’s a building named for JOHN JAY at Columbia, where I went to law school. 21a, CHINA SEA [*It’s east of Okinawa]. JAY is a homophone of the letter J; SEA of the letter C… I’m sensing a pattern. 35a, BUSY BEE [*Sort with a full schedule]. This confirmed my suspicion that: The theme is two-word phrases where the second word is a homophone of the initial letter of the first word. 48a, TEXAS TEA [*Oil, jocularly]. Sadly “black gold” doesn’t fit the theme. 51a, UP TO YOU [*I don’t care either way]. This threw me for a loop; I guess: The actual theme is just phrases (of at least two words) where the last word is a homophone of the initial letter of the first word. 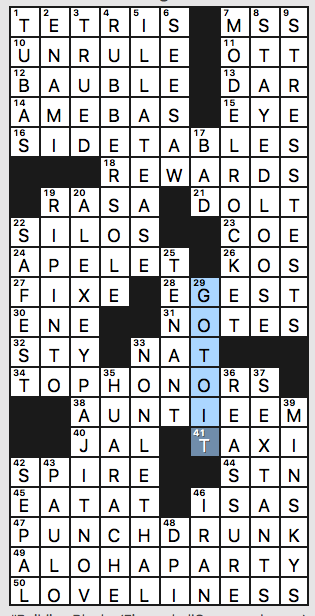 This is a fairly unusual Thursday puzzle, in that it’s not too often we get a meta element in the NYT. I ignored it while solving, and it ended up feeling like a high-word-count themeless puzzle to me. I didn’t come up with the theme until reflecting on it post-solve, and I suspect a lot of solvers will have a similar experience. The fact that the theme was limited to five very short answers meant there was room to let the fill shine elsewhere, and it did, mostly in the long downs: LOSS LEADERS and TRIPLE AXELS were both lovely, as were CRAZY IDEA, MOON BASE, and BAKE SALE. Lots of other 7s (GUNSHOT, GOOFS UP, RED BULL, LATE FEE), and I loved seeing the colloquial K-STATE. A few ugly short answers to compensate for all that shiny stuff (TAJ, AMO, NTH, and NEAPS all in the NW, plus A DUEL). I’m probably one of the few solvers who relishes seeing IVO Andric in the grid, so I’m willing to add that to the naughty list, and “FEEL OK?” looks a bit strange in the south of the grid. The thing that cost me the most time was confidently dropping in “HI, M’AAM” at 38a [Respectful greeting] from the ?? ?AAM, when in fact the answer was SALAAM. Thankfully, my figure skating fandom bailed me out fairly quickly, but that’s a very nice misdirection, intentional or not. This one might’ve been more at home in the Chronicle of Higher Education, but it was a refreshing, zippy departure from the usual Thursday fare. Until next week! This is a first for me: I knew the theme before I entered a single answer. I suspect it’s also a personal best for a Fireball time. The grid is funny-shaped, and 1a tells us why: 1a [Game with seven distinct shapes and a 10×20 playfield]. Sure enough, the grid is 10×20 (I counted). Plus the black squares form seven distinct – and familiar – shapes. The shapes gave me the theme before I even looked at the clue, and the answer, of course, is TETRIS. There’s one more theme entry at 20d: [Creator of 1-Across]. This was not a gimme. Turns out it’s ALEXEY PAJITNOV. Not much theme material, but the Scrabbly name and the odd grid size constrain the fill with unpleasant results. APELET for a [Small simian]? Really? TOP HONORS for [Final awards on awards shows] is better, but not good. An ALOHA PARTY is a thing, but Google suggests that it’s not a [Farewell celebration in Hawaii] as much as a party theme on the mainland. There were things I liked. 4d [Kicks bottom] is RUBBER SOLE. “Kicks” started out as a term for sneakers, now extended to include other footwear. 7d [Toy for a future aerospace engineer, perhaps] is a MODEL ROCKET. My husband built and launched model rockets when he was a kid. He also took some fuel out to a vacant lot and lit it, just to see what would happen. How he survived to adulthood is a mystery to me. 25d [Flat fee payer] is a TENANT. 47a [Dazed and confused] is PUNCH DRUNK, which is right above ALOHA PARTY. I suspect you could get drunk on punch at an ALOHA PARTY. 46a [“Stupid ___ stupid …”] needs IS AS. I’m more familiar with “pretty is as pretty does” but I’ll accept other formulations. 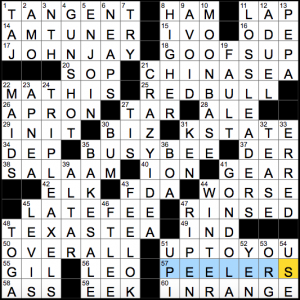 What I didn’t know before I did this puzzle: in addition to being unfamiliar with the creator of TETRIS, I also did not know that IRAN was a big pistachio exporter. Are big pistachios more expensive? For those who’ve managed to forget it, here’s the TETRIS theme song. For ten hours. It’s amazing what you can find on YouTube. The title is a good hint to what’s going on here. The “brr” sound is prepended to various words and phrases for wintry wackiness. Spelling changes implemented as needed. 24a [Explosive zap from a sci-fi weapon?] BURSTING RAY. Stingray. I’m not sure that “bursting” is how I would describe a ray gun’s discharge. 36a [Future deliveries?] BIRTHINGS TO COME. Things to come. My spellchecker doesn’t like the word “birthings.” While tossing around entry ideas for my own “brr” puzzle, I came up with THROWBACK BIRTHERS DAY, but couldn’t work it into the grid. 44a [Money used to build many a California film studio?] BURBANK LOAN. Bank loan. 56a [Souvenirs from Sanders rallies?] 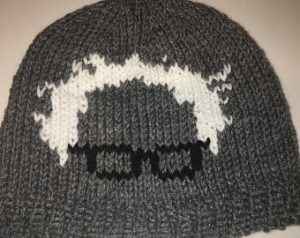 BERNIE CAPS. Kneecaps. This one acted as revealer for me. Together with the title, I was able to fill in three of the other four entries with minimal crossings. I like the theme fine, but the entries just don’t do a lot for me. I do like BIRDIE FLAT as it’s imaginative and fun, and BERNIE CAPS is good, though they are real things (though maybe not in name). The rest just don’t have much punch to them. To add to the theme, there is a plethora of cold-related clues throughout the grid. For example, WEST gets the clue [Cold War side] and ARIEL gets the clue [Winter of “Modern Family”]. Plus there are references to skis, the Andes, Klondike Bars, Snow White, Winter Olympics, etc. It had me guessing where the the theme actually lay until I revealed the first theme entry. As such, it felt like a bit of a distraction. Plus, there were a lot of proper names I didn’t know: the aforementioned ARIEL, IVAN Provorov, Ryan ELLIS, and POSEY Parker. 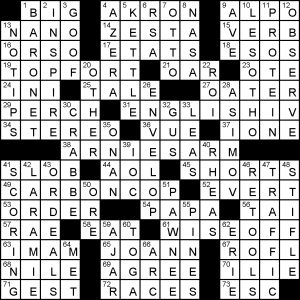 Plus rarely-seen-outside-of-crosswords entries AGITA and WAIN. This is a real creature that exists somewhere. 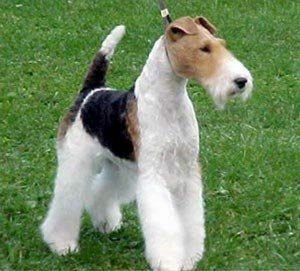 As for the longer fill, BY THE DAY [How skis may be rented] is not the strongest of entries, but I do like WIREHAIRS, START-UPS, NECKWEAR, SPIRITED, and TO NO AVAIL. I’m not an opera guy, so I had to dig deep to find MASSENET and even then wasn’t so sure of the spelling. 28a [Person who’s critical at first]. UMP. Ha! I only just now got this. Who’s at first? The UMP of course. 49a [Torch lighter of 1996]. ALI. Along with the ARIES clue, this one gives a warm respite from all the cold clues. 59a [“I am not what I am” speaker]. IAGO. Well, I figured it wasn’t Popeye. 61a [It’s spread on snowy roads]. SAND. How many of you put SALT there first? 6d [Mass consumption?]. WAFERS. Far be it from me to start a theological debate, but Catholic teaching is that, during the Mass, bread is transubstantiated into the actual body of Christ. So the answer WAFERS denies those who hold this belief. Better to just steer clear and stick with the old [Nilla ___]. Not a bad puzzle today, but it lacked some of the flash we’ve seen recently, and many trivia-based clues felt cumbersome. I figured out the theme fairly early, at the first answer, though was still pleased to discover a revealer, WISEOFF, at the end. That’s “Y’s off” and a terminal Y is lost, making wacky answers. Pronunciation is only changed once, with the other three being simple drops… TOPFORT, ENGLISHIV, ARNIESARM, CARBONCOP are the set. My error was ACERA/CESTA; that Z was not gettable for me. The other major cultural learning was JOANN craft stores; there are 850 in the US quoth wikipedia. NOTIPS – [Custom on some cruises]. Anyone going on this one? Both of the long bits of fill here (NAUGHTY BY NATURE and NICE GOING, GENIUS) were very nice, as was the shout out to BUTTER PECAN, which I wouldn’t say is my favorite ice cream (that’d currently be Earl Grey), but it’s up there, and it’s certainly BEQ’s favorite. ULEES Gold: a film that has been clued more than seen. NYNEX felt real obscure as far as fill goes, and I really doubted there was such a thing as a GYROCAR, but here we are. DANGS were the right PG-swears, but I definitely tried DAMNS and DARNS first. This entry was posted in Daily Puzzles and tagged Brendan Emmett Quigley, Damien Peterson, Dan Schoenholz, Mark McClain, Mike Shenk, Peter Gordon. Bookmark the permalink. Nice to see a meta in the NYT—I rarely find the meta answers, so felt very accomplished. It took just the right amount of time too. So I’m not gonna lose sleep over the clue for TRIPLE AXEL or anything, but it seems like this is the second time this year we’ve gotten a clue something along the lines of “thing a woman can’t do as well as a man”. Regrettably I can’t remember what the other instance was, just that it got discussed here. It’s certainly accurate to say that one needs massive quads to pull off a triple axel, and that some bodies, mostly male bodies, build muscle mass like that more effectively. And it’s an achievement when a female athlete pulls it off in performance, yes. I just found the focus of the clue a little odd. Am I overthinking it? I stopped watching figure skating when Tara Lipinski won Olympic gold. I’m not knocking Tara, but Michelle Kwan won on artistry and maturity of movement ten ways to Sunday. In the history of Olympic sports, there is the American loss of the 1972 gold medal in basketball when the Soviet Union got a do-over in the final three seconds; there is the truly unbelievable awarding of the boxing gold medal in Seoul in 1988 to a Korean over Roy Jones–who outhit him 3,000,000 to 6; and a propos to your comment, there is Sochi in 2014 when the surpassingly elegant Kim Yu-Na lost the gold to a Russian who scored more than 20 points higher than she ever had in her life. Nothing like home cookin’. Michelle Kwan was indeed elegant but not perfect, but there was at least some legitimacy to Tara, who skated beautifully, being awarded gold. And Tara and Johnny Weir are fabulous and funny skating (and almost anything else) commentators. the daily puzzle solvers in America do not have the slightest idea of what the hell the theme is about. I’m also quite sure the 1% that do feel a bit smug. A puzzle just for us. 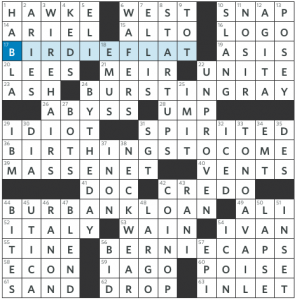 I liked the NYT puzzle and meta. But I think I enjoyed today’s LAT puzzle even more, though I could have done done without the AZERA/ZESTA cross. Anyway, cute theme, made me smile. 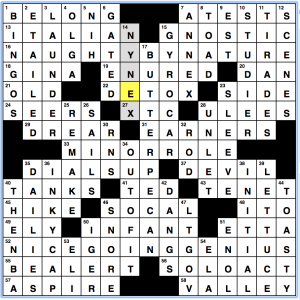 I agree with others that the NYT clue for TRIPLE AXELS detracted from the puzzle. I had no trouble filling in the answer but I just shook my head and said “Why?” when I read the clue. There are so many other ways to clue that answer. The Fireball was fun, but seriously, 24A is a Mr. Fantastic stretch for fill’s sake. Amen to Tracy B’s critique of TRIPLEAXEL in the NYT.